Tour expansive wetlands northest of San Francisco, with otters, falcons, and elk. Making up over 10 percent of California’s remaining natural wetlands, the Suisun (suh-soon) Marsh , 35 miles northeast of San Francisco, is a massive environmental gem—nearly 116,000 acres of rich and diverse habitat for plants and wildlife. Sitting at the confluence of the Sacramento and San Joaquin Rivers, it’s a striking area of low-lying islands and silent, sprawling tidal wetlands, and offers great hiking (trails are level and easy), wildlife viewing, and fishing. 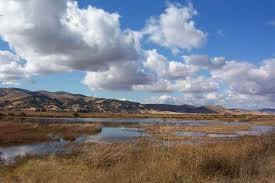 Within the Suisun Marsh is the Grizzly Island complex, an impressive 15,000 acres with 75 miles of roads and trails. To explore Grizzly Island, walk the graveled trails at Peytonia Slough. Wherever you hike, keep a close eye on the trail; you might see river otter footprints or the hoof marks of tule elk. Introduced to the island in the late ’70s, the elk have flourished. Bring binoculars to scan the skies, water, and trees too: the marsh is home to over 220 species of birds. If you’re lucky, you might spot a rare peregrine falcon. Fisherman, take note: Grizzly Island’s waters are home to striped bass, white catfish, white sturgeon, black crappie, and even the occasional largemouth bass. Fishing tip: Bass seem most abundant in early summer, when the normally brackish waters of the marsh are at their freshest.